Once again, thousands have marched in the city of Bilbao to protest the "policy of dispersal" against Basque prisoners and call for their repatriation. The city of Bilbao became more crowded as the day went on. People were coming from all over the Basque Country and by noon it was impossible to walk around the city centre. The main streets surrounding the meeting points from which the demonstration was going to start at 5pm were getting packed as this time got closer. “Sare” (meaning literally “Network” in Basque, a citizen network struggling for the rights of Basque political prisoners) was in the way of achieving the objective of the day. This article is a chronicle of that demonstration. 25 years ago the Spanish and French governments enforced the policy of dispersal against Basque political prisoners. Since then, and according to the information given by “Sare”, the family members and friends that visit the these prisoners travel 352,329 km every week, as much as circumnavigating the earth 8.8 times weekly. The policy of dispersal has an average cost of 12,257 euros per family a year and 16 people have died in traffic accidents while going to visit their dear ones. 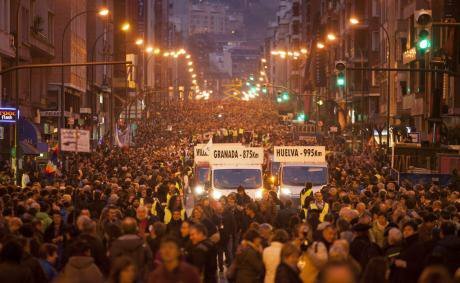 As in last years, there have been massive demonstrations in Bilbao in order to demand respect for the rights of the Basque political prisoners and the end of the policy of dispersal. This year the demonstration had a different structure. Instead of starting from a square and going down to the City Hall, (a distance of 2 kilometres) it started from both sides and joined together in a middle point between both ends. The families of the political prisoners opened the way in their usual lined structure. 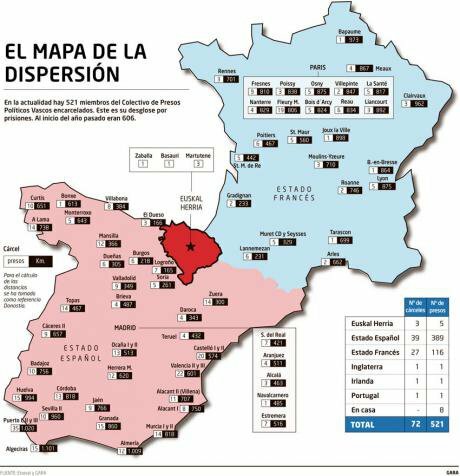 Currently there are around 460 Basque political prisoners in 73 jails in France and Spain. Within this collective, there are members of ETA, pro-independence politicians, trade union members, members of the youth movement and journalists. The Spanish government categorises the whole of them as “everything is ETA”. Like the organizers had underlined once and again the protagonists were the citizens and the families of the political prisoners. On Saturday those political parties, trade unions, organizations and well known people that had shown their support for the demonstration were kept in a second line. Among the protagonists there were also key figures in this issue of the dispersal policy applied against the Basque political prisoners; the Mirentxin vans that week after week drive the families voluntarily to prisons scattered all over France and Spain as a sign of solidarity. On Saturday they were the ones opening the roads of Bilbao too. Two kilometres of road packed with citizens. Lots of them didn´t even have the possibility to move at all and following the recommendations of the organizers they have just occupied the streets. It has been achieved. 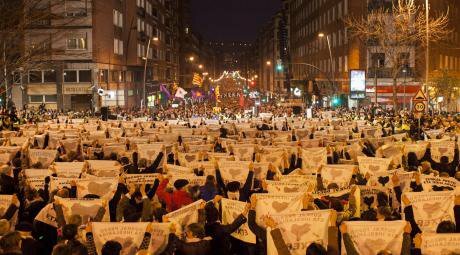 Once again thousands of people demanded in silence the repatriation of the Basque political prisoners to the Basque Country. Like the main slogan stated, Now to the Basque Country! The demonstration was silent as demanded by the organizers, a demand well respected by the participants. 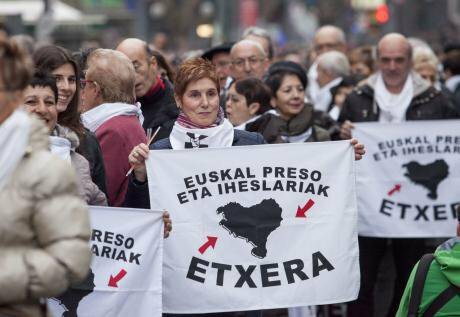 Only two slogans have followed the whole demonstration in its way; “Basque prisoners to the Basque Country” and “Bring the Basque political prisoners home”. While many are the comparisons that can be made with last year's demonstration where around 130.000 people marched for "human rights, resolution, peace", two are the ones that stand out among others. Last year's demonstration was firstly prohibited by the Spanish National Court and and as a consequence that the PNV (Basque Nationalist Party) ended up supporting the demonstration. 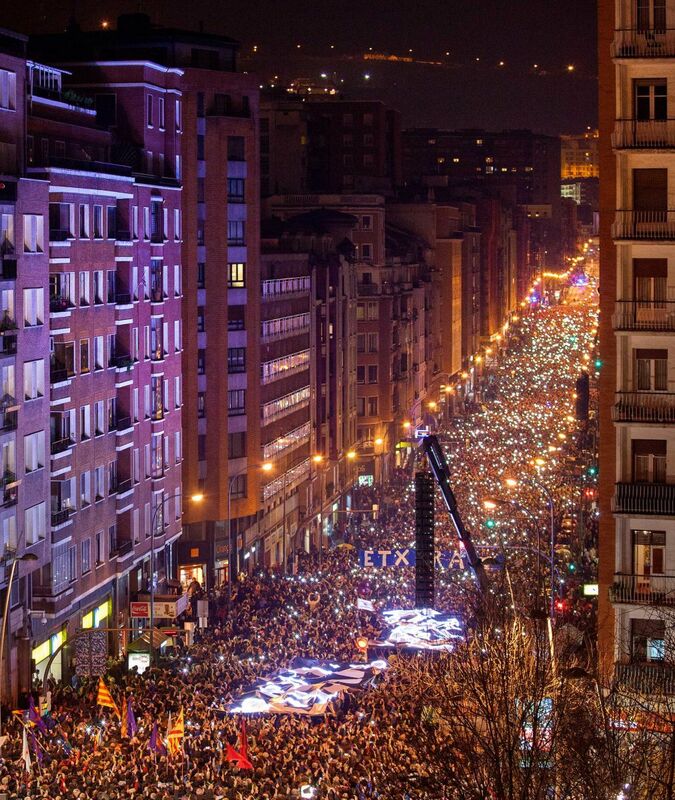 Certainly last year in Bilbao, there was a stronger feeling of solidarity and a great amount of euphoria. The support shown towards the Basque political prisoners this year has been strong too but within a more relaxed environment. This year the PNV hasn't supported the demonstration outlining at the same time that last year they did so because of its prohibition. Maite Mangado and Hegoa Arakama, family members of Basque political prisoners, demanded that the rights of the Basque political prisoners as well as those of their family members have to be respected. “Those rights must be respected now! Not tomorrow or the day after! It has to be now because among other reasons this attitude also helps the peace process.” They have both outlined that the policy of dispersal is a policy of revenge and that with the support of the society “the wall representing the policy of dispersal will be brought to an end. We call you to walk together towards that end, step by step.” Finally they invited people to join “Sare”, the network working for the rights of Basque political prisoners. The light has become another protagonist of this demonstration. At the end of it thousands of lights have been lit in the hands of the participants obtaining thus a strong picture. People have started moving on, some went towards the bars, others to take the buses...and lots of them probably still remember the last words of the poem sung by the improviser Amets Arzalluz: “It is not easy year after year/to bring more people here/and we hope that next year/ you will come to celebrate (we brought them home)”.